Well it's been a long time coming but we finally finished our mudroom/ front entrance. It's really a hybrid of the two, since it's the only entrance to our house technically it's a front entrance. But because it's the only entrance we needed it function, well, like a mudroom. The room is only 4 feet by 5 feet and that included the closet space. It had bi-fold doors on the closet. The doors took up way too much space when opened and made the already tiny room smaller when closed, so the first thing we did was remove them. 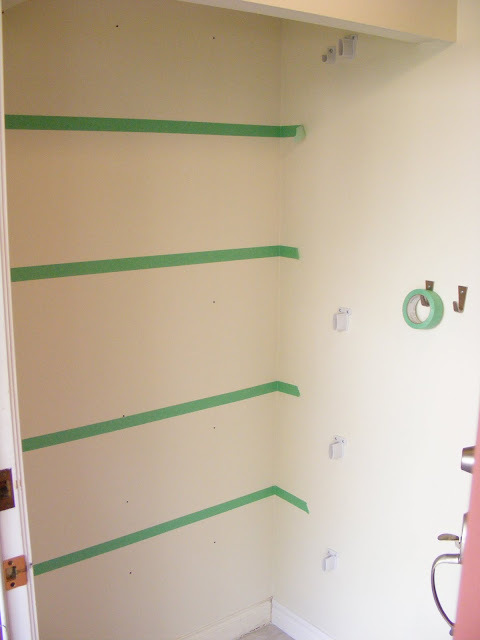 Once the doors were off we Lee painted Large Green Stripes on the wall using Martha Stewarts new line of paint. We used her Bay Leaf color and I couldn't be more in love with it. Lee also said he really liked her paint, it went on smoothly, although bubbled a bit when rolling, he suggested using a foam roller when painting. As an added bonus, we only had to purchase a $5 tester and that was enough for the stripes. Talk about big impact, low price. 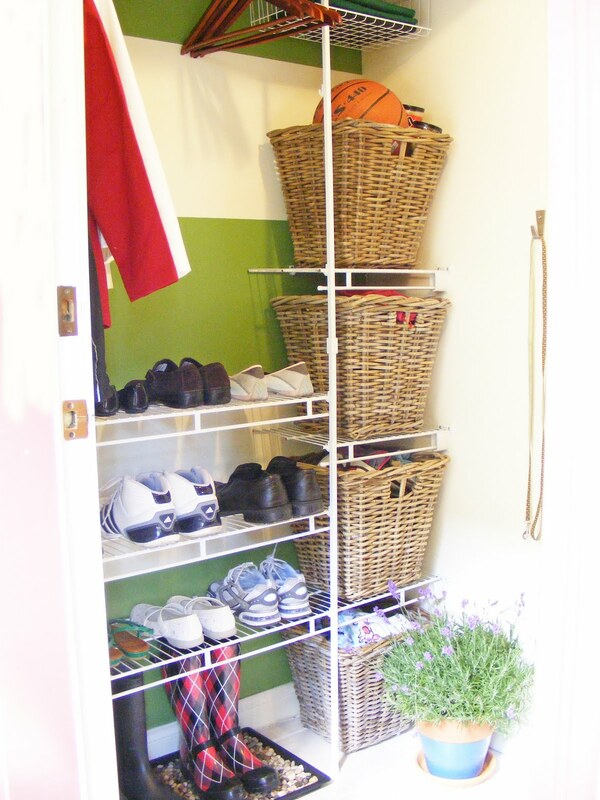 Then we installed a simple, very inexpensive closet unit. I know they aren't the most attractive unit's but the price was right, and with a few lovely baskets they looked a lot nicer. 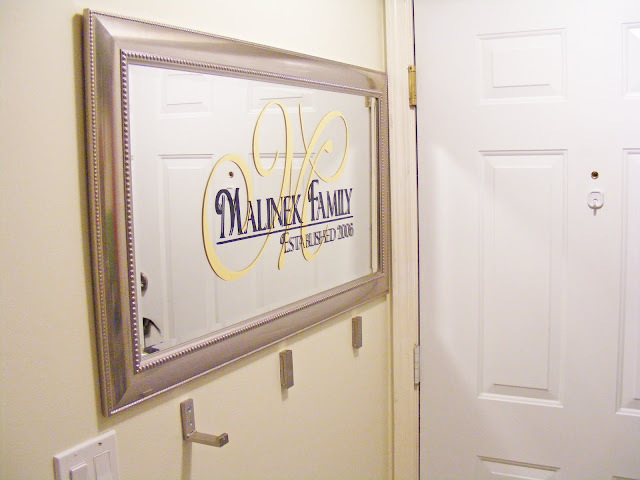 We installed a mirror for a quick hair checks on the way out the door, but to add a little extra to it, we ordered a vinyl decal from Etsy. The decal came in four pieces. The Big M was one, The Malinek Family was another and Established 2006 was another. In case you were wondering why 2006 it's because we were married in January of 2006. Underneath the mirror are these fabulous Ikea hooks. Because the room is so tiny, any amount of saved space is welcomed, even if it is only an inch. These little hooks unfold to hold jackets and purses, and fold away to save space when they aren't in use. Genius, Ikea has such smart ideas sometimes. Of coarse you remember the boot tray project from Mondays Post. 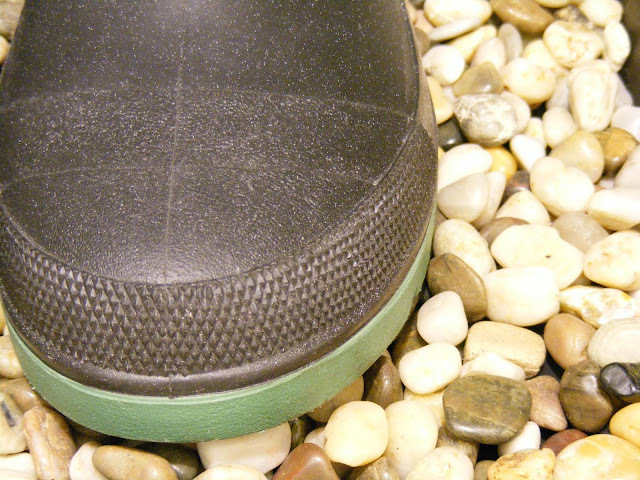 I love the boot tray so much I still wanted to show you more pictures about it! It's pretty and functional. And anytime function and style meet makes me happy! 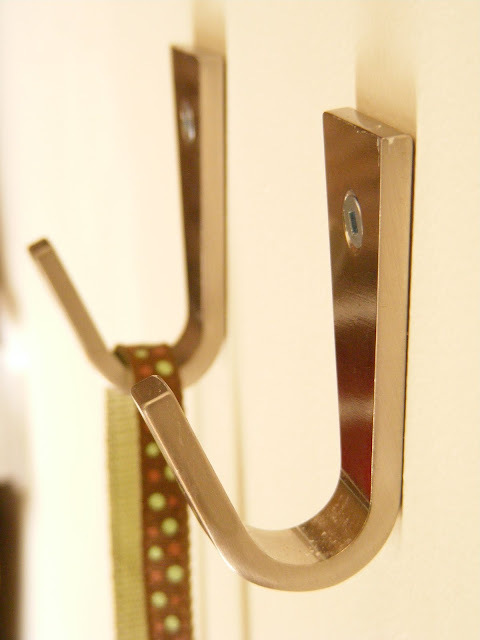 We also added two little hooks, also from Ikea, to hang the dog leash from. So there is our Mudroom. I tried to add as much style without compromising at all on the function. And all on a budget. Very nice! It gives me a great idea for my back porch/laundry room. Thanks for sharing! Brilliant! Your site is so inspiring! Love the stripes! Love the shoe storage! Thanks so much, and Yes those striped did come out of one Paint sample jar. We bought two just in case, but only used one, we used every last drop but only one jar! I'm in LOVE with your whole entry! Those green stripes are to die for! (So is your sweet little Max!) Wonderful job!! I am sooo stealing this idea!! I LOVE it! 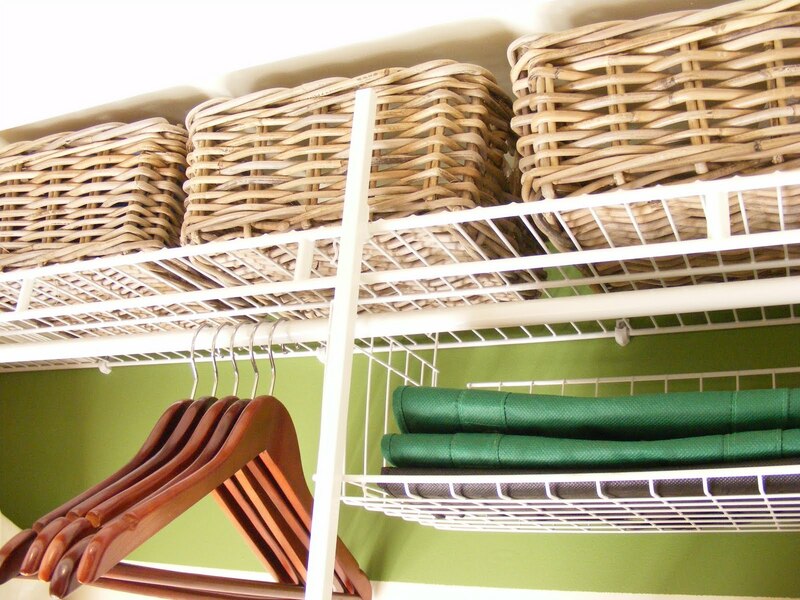 I need my mudroom/laundry room to be that organized! Wow--looks Fab! 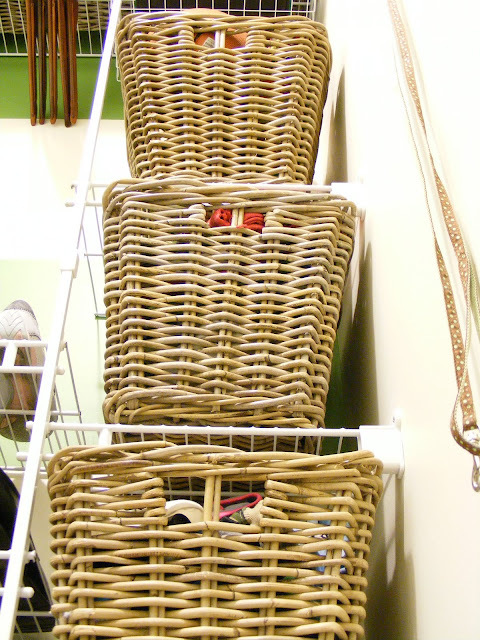 It's amazing how baskets are able to dress up a space, and be so functional. What a great Mudroom! I was just telling my son today that we needed to get our back porch area organized before school started again and we have backpacks and shoes everywhere. Love the mirror, and $12.99 for the decals is a great price! Congrats on a job well done! Awesome job! I'm not a big fan of dark colors on the walls, but the stripes break up the boldness of the color. I love when people show me I can be totally wrong about something. Thanks! Also- Max is ADORABLE! I want to give him big smoochies! I have a little Yorkie as well. He's my baby. From whom on Etsy did you order the decals? They are perfect, especially at that price! Thanks, I was very worried about the green stripes but I'm so glad everyone likes them!!! You guys are the best!!! The store on etsy was going out of business so I got them for a bit of a deal, but if you type in Family Decal into etsy it comes up with the same ones for around the same price. VYNALFORALL has great prices! Very cute! 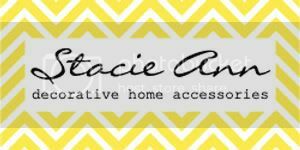 I also ordered a decal from Etsy for our wall...can't wait to try it out! Great idea, though! We have no need for mudroom here in So.Cal. but I like how you have everything in it's place! What a great and refreshing blog! I love all that you've done. Thanks for sharing! How big are the stripes? I love them! That looks like the exact shade of my kitchen, except I used Behr paint years ago. I'd loved to give my coat closet a punch. 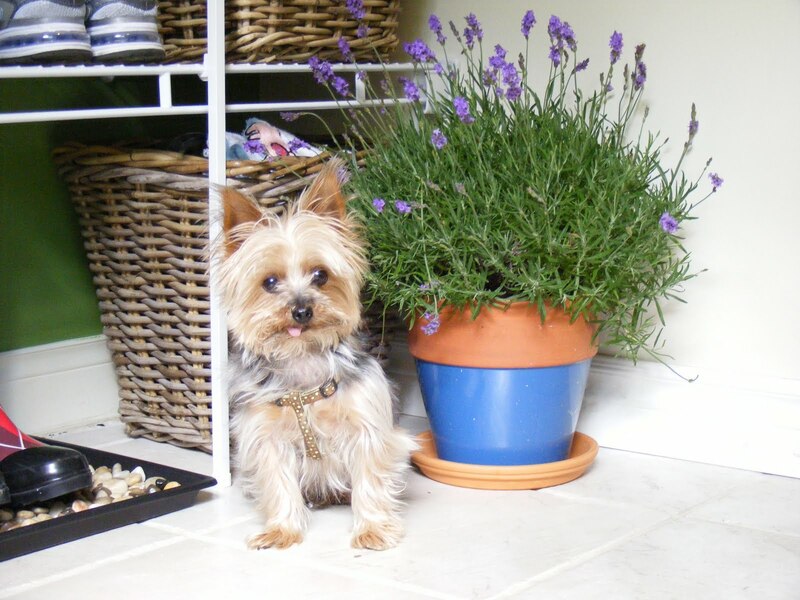 Love the Fur Baby and the mudroom too! 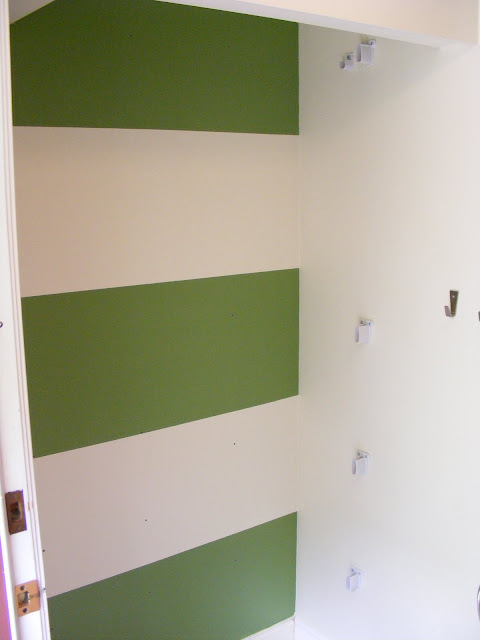 I love the stripes- in fact you've provided inspiration for our sewing room! Green and white stripes it is! Many thanks! Judging from the dates on the comments (your posts don't have dates) this must be from your old home, right? 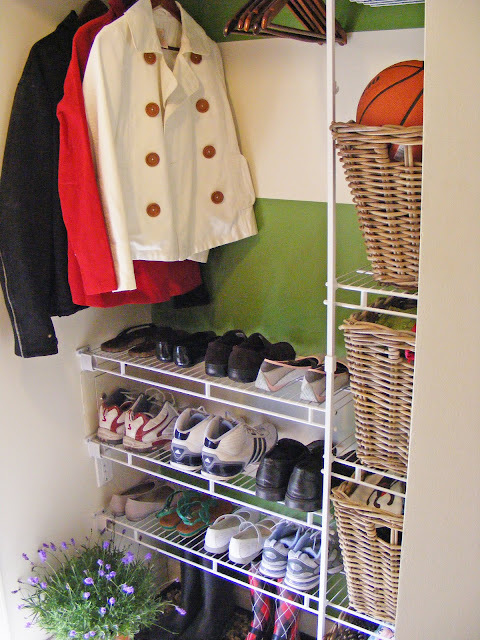 Well, I linked it to my mudrooms and entryways post today - for inspiration. You did a beautiful job! I'm new to your blog after seeing the post on iheartorganizing today. I'm here to stay and now am following. love your organization posts! 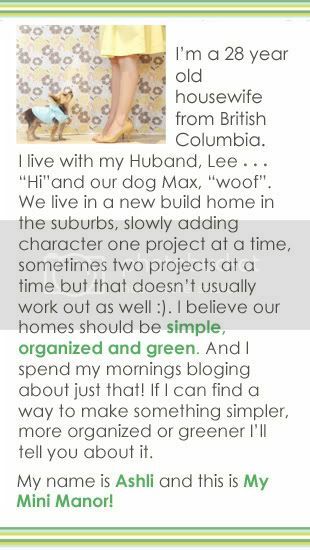 I love the green stripes and the wicker baskets and your doggie in the last picture, it's too cute how his little tongue sticks out. 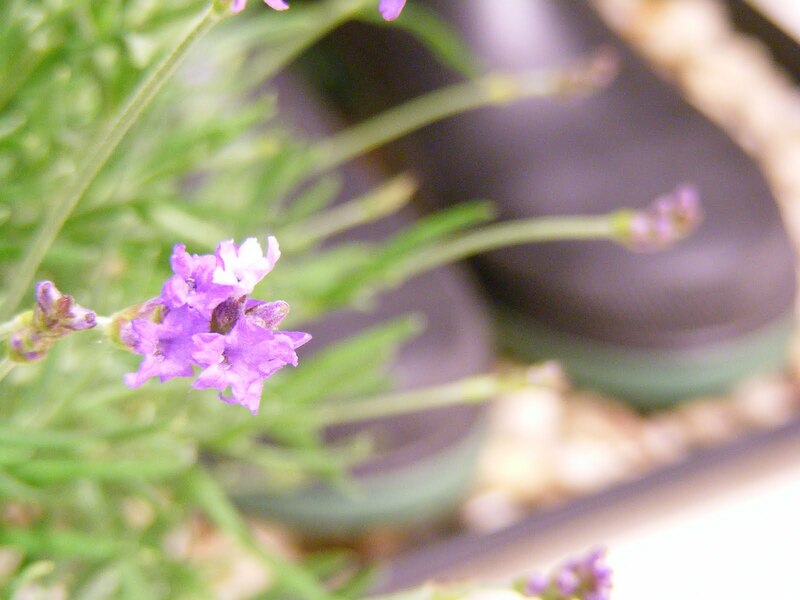 The pot of lavender gives everything a really laid-back look in all its functionality. I popped over from iheartorganizing and you have me hooked! I love this post! We have a tiny entryway with those blasted bi-fold doors on the closet, too. So many good ideas here that I will be...um...stealing ;) Thanks for sharing! 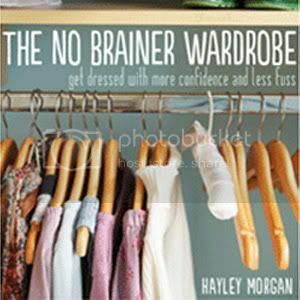 i just found your blog via pinterest - looking for hall closet organization ideas - and then saw that you live in bc too! i live in vancouver and love seeing awesome local blogs. 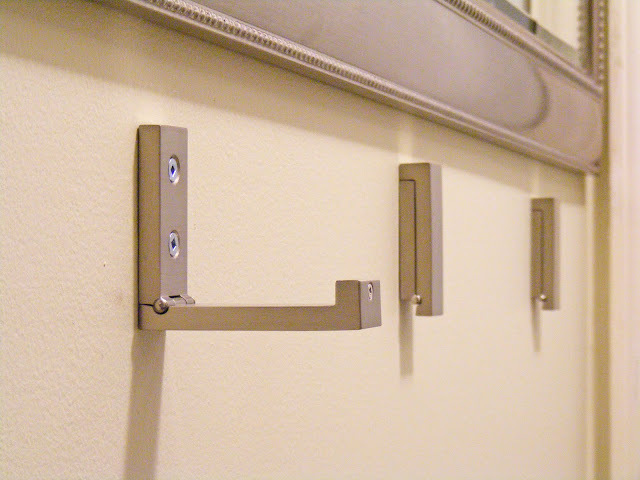 and i have definitely been inspired by your mudroom, thanks! I truly LOVE the huge green stripes! I've been wanting/needing to repaint my sons room and was thinking stripes, but wasn't sure how, and now I know!!! And I already have the green paint!! Next project on my huge list of undone to-do's!!!! So leave a word and you'll be heard! Billy Bookcase all trimmed out!